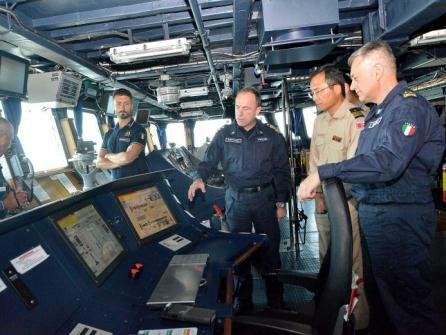 Officers from the Japanese Ship (JS) Harusame, currently assigned to the Combined Maritime Forces (CMF) counter-piracy task force CTF-151, took the opportunity to visit the flagship of the EU Naval Force counter-piracy mission, Italian Ship (ITS) Andrea Doria, when they found themselves operating in close proximity. Following a high level of piracy attacks off the coast of Somalia, CMF established CTF-151 in 2009 to work with other international organisations, such as the EU Naval Force, to deter, disrupt and thwart piracy operations. Opportunities such as this meeting at sea offer a chance to share best practice and ensure that the international community can work together as effectively as possible to defeat piracy. 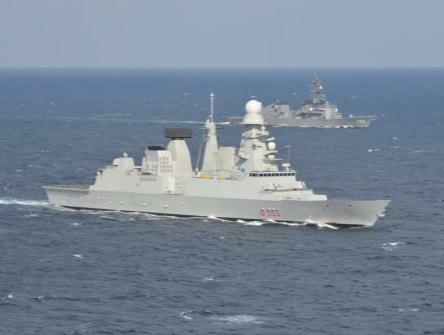 JS Harusame, assigned to CMF and also home to the Japanese national 20th Deployed Surface Force for Counter-Piracy, was operating in the Gulf of Aden when ITS Andrea Doria, escorting a World Food Programme ship, sailed close by. 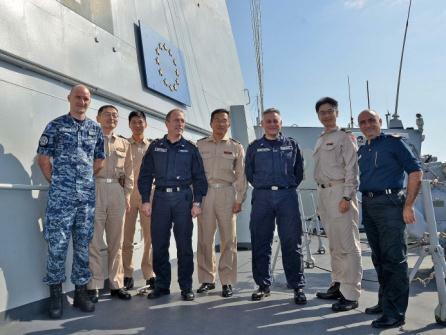 Leading the delegation from JS Harusame, Captain Masatoshi Kashihara, commander of the 20th Deployment of the Surface Force for Piracy Enforcement, was welcomed onboard by the EU Force Commander, Rear Admiral Guido Rando, and the Commanding Officer of ITS.Andrea Doria, Captain Virdis. 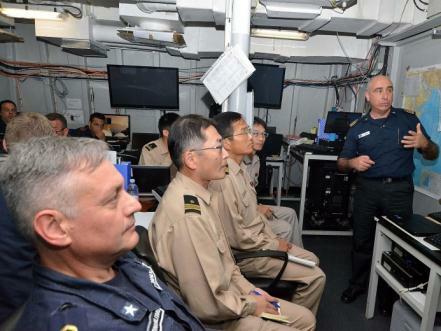 Having received an update briefing on the area of operations from the EU Naval Force, the Japanese officers were given a guided a tour of ITS Andrea Doria. The discussions throughout the day focused on enhancing the already strong bonds between CMF and the EU Naval Force, and sharing best practice on conducting counter-piracy operations.